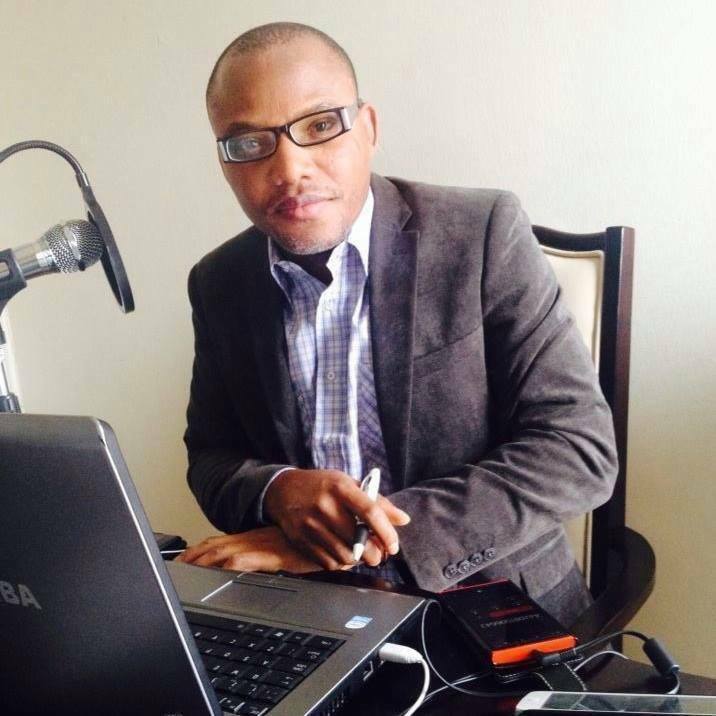 The plan by tyrant Buhari to kill mazi Nnamdi Kanu,leader of indigenous people of Biafra and director of radio Biafra London has been revealed.It is a grand secretive plan intended to use the boko haram members and Nigeria army to execute. This was contained in the Army secret memo sign by Col Suleiman On behalf of chief of Army staff General Burutai which in part reads" information at the disposal of this headquarters strongly points to plans by BHT Group to attack various locations in different parts of the country. The targeted areas include but not limited to police station, prison facilities schools markets places....the terrorists are reported to have deployed their foot soldiers to carry out attacks in Bauchi Katsina and Imo states"
It is imperative that the whole world and all lovers of freedom should support the justified call for the freedom of BIAFRA and immediate release of Maxi Nnamdi Kanu,leader of the indigenous people of Biafra and director radio Biafra London. The Biafra people are distinct people in southern Nigeria denied of the four freedoms; political freedom, economic freedom, social freedom and above all religious freedom. A people hunted daily like games by Nigeria armed forces. People whose wealth feeds Nigeria is presently under siege and military occupation. Nigeria is a fraudulent country hosting the most dreaded Islamic terror groups Bokoharam and Fulani herdsmen. These groups are responsible for extravagant destruction of valued lives and properties. Their siege in Biafra land has seen women raped, kidnappings, incessant massacre of Biafra people in dwelling places coupled with destruction of farm lands. Mazi Nnamdi Kanu a prisoner of conscience has been extra judicially imprisoned since 14th October, 2015 in Kuje prisons Abuja Nigeria. His offence is calling for recognition of Biafra genocide of 1967-1970 and self determination of indigenous people of Biafra as enshrined in United Nations charter. His unwarranted arrest by Islamic republic of Nigeria has spark off incessant peaceful protest all over the world and Biafra land. Buhari and his murderous armed forces has been brutally killing peaceful, defenceless, innocent Biafra youths. The blackest day was the massacre of over three hundred Biafra people observing morning mass in St. Edmund Catholic Church Nkpor Agu in Biafra land on 30th May,2016. Many were arrested and incarcerated in various prison cells across Nigeria. These prisons are the ones earmarked for devastating attack by this Boko haram Islamic terrorists and NNAMDI KANU safety and the lives of those Biafrans detained together with him are no longer guaranteed. They can't have a Nigeria to call their own if anything happens to Nnamdi Kanu. Long live Biafra. Long live IPOB. Long live Nnamdi Kanu. Every Biafran must be prepared to do something if Nnamdi Kanu is killed in Nigerian prison by whatever means or if anything happens to him while detained. We must do whatever necessary to destroy this evil contraption and hell called Nigeria. Buhari and his advisers are complete failures and disgrace to humanity. We must not permit this satanic evil to happen unpunished. Nigeria must be destroyed period!